Reagan Goforth, Spinal Muscular Atrophy | Stem Cell Treatment Testimonial Reagan was clinically diagnosed with SMA at 6 months after extensive genetic testing due to delayed motor function and and overall delay in hitting infant milestones was noticed. 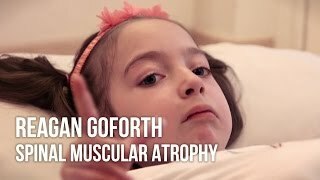 In some cases, Spinal Muscular Atrophy can be fatal. Due to Reagan's stem cell treatments she remains cognizant and aware of her surroundings. Reagan is in fantastic health at the moment. She has continued to gain motor and oral functions over the past 2 years resulting in increased ability to feed herself, be potty trained on a special toilet, and sit in a normal chair with the aid of a back brace.